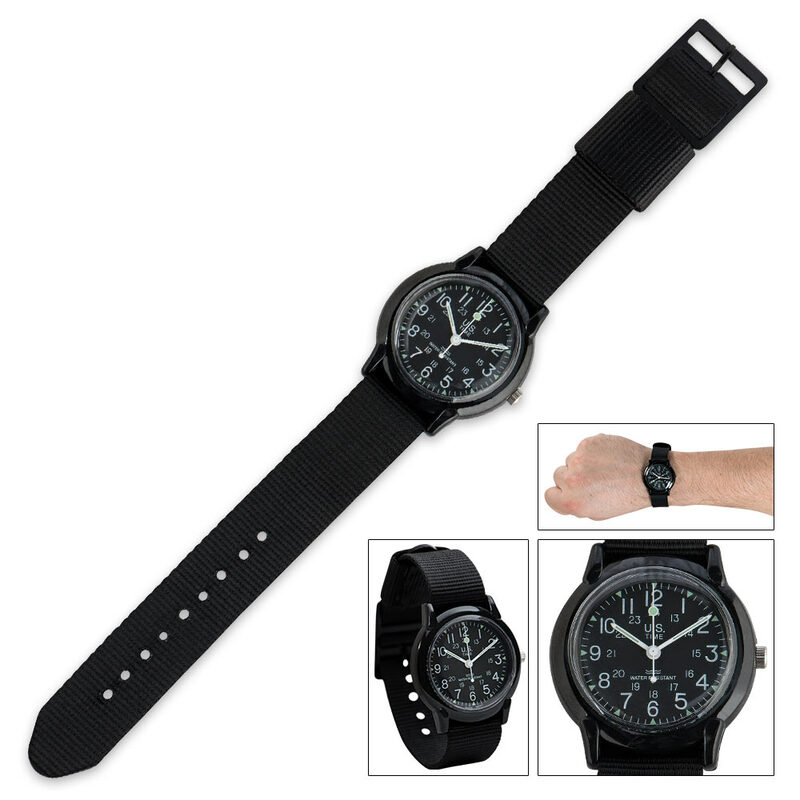 US Time Ranger Watch | BUDK.com - Knives & Swords At The Lowest Prices! This US Time Ranger watch combines classic looks with completely modern mechanics. It features precision Swiss quartz movement with a quartz battery. The highly luminous hands are set against a black dial for ease of viewing, day or night. I have bought 4 of these watches over time, Not a bit of problems, I take the watch off when I'm doing water things, Well just my opinion over the past 10 yrs. or so the watches preformed well. OK, 11 bucks for 2-3 yrs of good time keeping, key word "11 bucks", then trash can it and put on a new one. The watch is all plastic except for the stainless steel back. I had to replace the strap because the original strap was too short to fit around my wrist! However, the watch keeps perfect time, light on the wrist and I don't know about it being water proof but don't plan on dumping it in a bucket of water or taking a shower while wearing it. Bottom line, keeps perfect time and you get what you pay for with this item, no more, no less. Happy trails. The cover cheap plastic and easily scratched. Also, it is NOT water-resistant (even though the watch face says it is): even taking a shower with it on will fill it with water. I went tubing down a river last week. The watch didn't go more than six inches into the water but filled up anyway. Worked while wet, but stopped completely the next day. Not really worth the money--save and buy something higher quality.